More sweet snacks to share as I wanted to clear the pack of glutinous flour which is expiring soon ^.^ Before I attempted this strawberry wrapped mochi, I knew that it won't be a easy job. The cooking of the mochi is really simple just by using microwave, is the wrapping process that kills me....arrgghhh After the mochi is cooked, you need to divide it into equal portions and wrap it up with the strawberries while is till hot, soft and stretchy! By the time I meddling with the last 2 pieces of the dough, I just feel like popping them into my mouth and skip the wrapping process hahaha....but in the end I still managed to come out with 6 rather not so pleasant looking strawberry daifuku いちご大福. Rinse, dry and hull the strawberries. Divide anko into 6 equal portions. 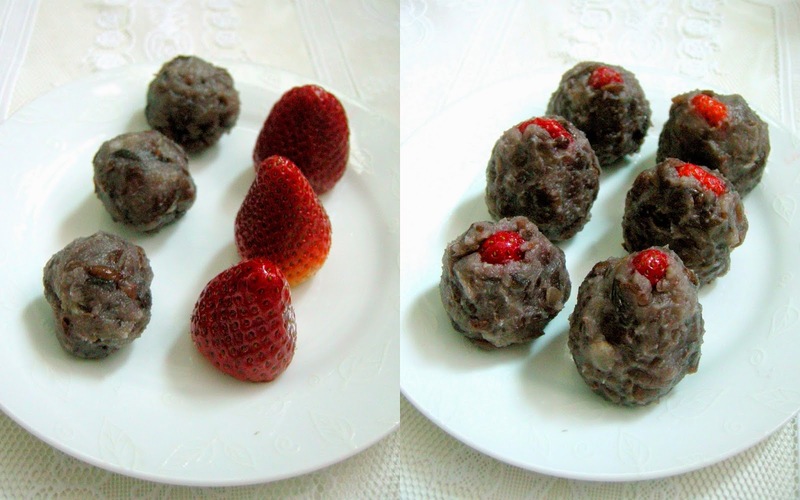 Wrap the strawberries with anko. Leave the tip of the strawberry uncovered. In a medium microwave safe glass bowl, mix glutinous rice flour with sugar. Slowly add water in 3 parts and stir until to dissolve the flour. Cover loosely with cling wrap. Microwave for 1 min. Remove and stir well with a wet silicone spatula. For the 2nd time, microwave for another 1 min again. Remove and stir well with a wet silicone spatula. For the 3rd time, microwave for only 30 seconds. Stir again and now the mixture should look translucent and soft. Sift cornstarch onto a tray and put the mochi on top. With a silicone spatula, fold the mochi in half one time so it won't be as sticky. Divide into 6 equal pieces. Put some cornstarch on your hands and flatten and stretch each kochi into a 3" round. Put the anko covered strawberry on top of it, with the tip facing down. Start covering the strawberry from all sides and use your thumb to hold the mochi on top. When all sides of mochi meet at the top, twist and seal the edge. Hold the mochi with both hands and form into a nice round shape. Repeat the process for the remaining mochi. Serve at room temperature and best serve within end of the day.